The car has been designed for the world's super rich to avoid congested roads of big cities, but comes with a hefty £2.5 million price tag. 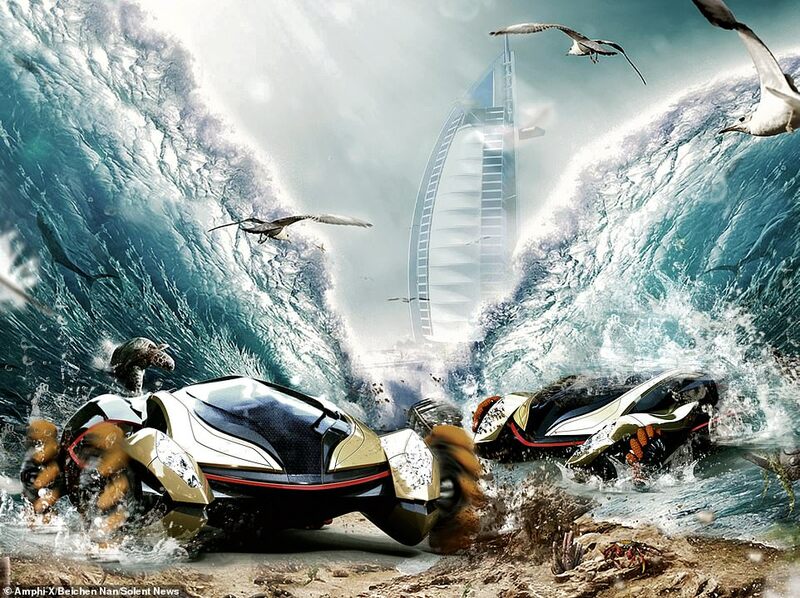 An amphibious supercar design that would allow its mega rich owners to look stylish and beat city traffic by travelling through water at high speed has been unveiled. The car has been designed for the world's super rich to avoid congested roads of big cities, but comes with a hefty £2.5 million price tag. Traditional amphibious cars that can travel on road and water are usually function-focused and can look clunky and mechanical. The Amphi-X promises to deliver the best of both worlds: cutting edge on both road and water. 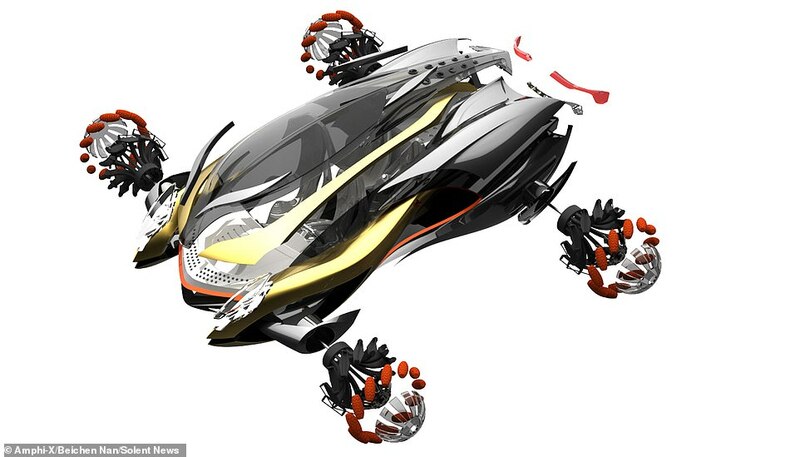 The car's creators say the futuristic vehicle was inspired by premium road cars including the Bugatti Veyron which costs £2.6 million ($3.4 million) and Lamborghini Aventador, favourites of the world's richest drivers. 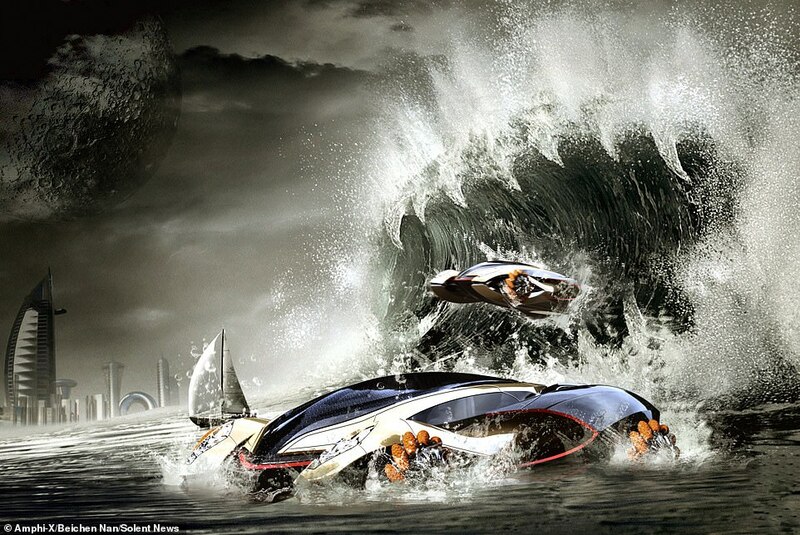 But unlike the Veyron, Amphi-X is also aims to hit high speeds on water. The car's wheels would retract on entering the water and be driven by a high-powered propulsion system similar to a jetski. The Amphi-X is built to seat four people and is made of carbon fibre and aluminium. With a unique tyre design, the Amphi-X would be able to travel over any terrain as well as move in any direction, which means that parallel parking could become a thing of the past. The Amphi-X is built to seat four people and is made of carbon fibre and aluminium and would be able to accelerate from 0 to 60 in 2.4 seconds, its creator claims. The concept is the brainchild of Bei Chen Nan, who designed the car as part of his final year industrial design project at Monash University in Melbourne. Mr Nan said: "The vehicle's size and dimensions were inspired by the exotic sports car, the Lamborghini Aventador or Bugatti Veyron, to give it the aesthetics of a supercar. Powered by a lithium-air battery the canopy of the vehicle would also be made from special solar cell glass, which would charge the battery even as it moved. With a unique tyre design, the Amphi-X would be able to travel over any terrain as well as move in any direction, which means that parallel parking could become a thing of the past, says its creator. "The Amphi-X is designed mostly for the wealthy market in Dubai. The cost of the vehicle will be equivalent to a luxury speed boat or a supercar. Mr Nan, from Melbourne, Australia, said he was inspired to designed the Amphi-X after reading an article in Top Gear magazine. "The article clearly stated that the current designs of the amphibious vehicle were shameful and better designs should be created", he said. "This was one of the key points of why I wanted to blend both the features of a boat and car into an aesthetically appealing amphibious vehicle." Mr Nan says he was also drawn to the fact most big cities in the world has a unused set of waterways running through it. Powered by a lithium-air battery the canopy of the vehicle would also be made from special solar cell glass, which would charge the battery even as it moved. 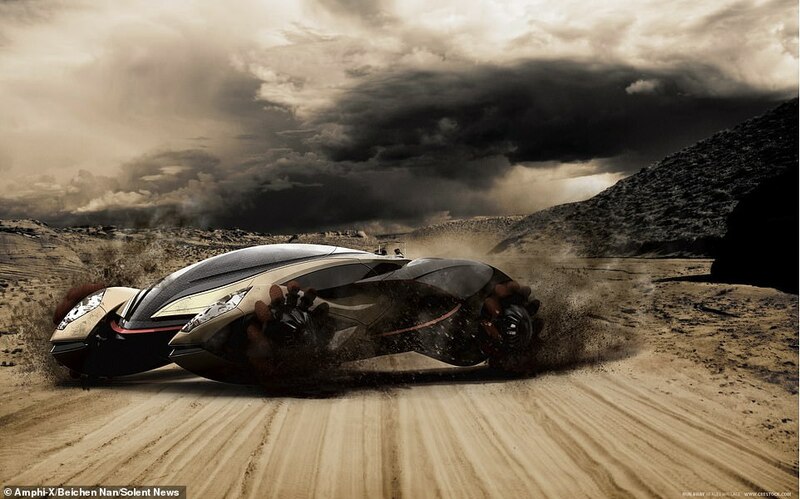 The car would be able to accelerate from 0 to 60 in 2.4 seconds, its creator claims. The car's creators say the futuristic vehicle was inspired by premium road cars including the Bugatti Veyron which costs around £2.6 million ($3.4 million) and Lamborghini Aventador, favourites of the world's richest drivers. Mr Nan says that while the car has been designed for the wealthy, he would love to see this vehicle in a James Bond film or a sci-fi movie like Avatar in the future. He said: "It would be a dream to have this design made someday, hopefully, there are some potential investors or a company."